What are the Hiring Companies looking for? Recruitment has changed significantly in past few years. Business is growing rapidly and companies are expanding internationally, in that scenario looking for a right talent who fits into the work culture and fast-growing business volume is indispensable. The traditional method of recruitment may not be sustainable in today’s era, thereby a unique concept of social recruitment has emerged and accepted by more than 80% of the companies across the world. 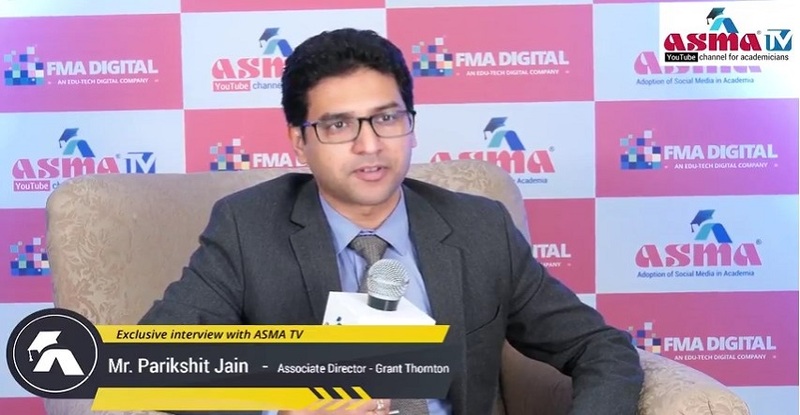 Mr. Parikshit Jain (Associate Director- Grant Thornton in India) speaks to ASMA TV in an interview about the future of social scoring in recruitment strategies. Here we have shared his views verbatim. Social Media is an integral part of day-to-day life, so as academicians, they need to be aware of the diversity or background your students are from. As a member of the placement committee, they need to know what all the hiring companies are looking for, as these companies are constantly watching candidate’s social media space. Students should understand how to capitalize on these disrupting technologies in the right manner. Institute’s placement cells should guide students how to place themselves on social media platforms and how to be active on social media to stay updated on the latest trends. What Grant Thornton In India Looks For? As a leading organization, Grant Thornton in India looks at the psychological and behavioral aspects of candidates before we hire them. We have a panelist who looks at a candidate’s social score and that has also become a business model. Based on the usage of the candidate’s mobile phones and the type of sites the candidate is visiting, we do social scoring. Since the candidate will be representing our brand, it is important for us to know these details. This way we capitalize on digital technologies for hiring the right talent. The landscape is changing very fast, technologies are evolving quickly and so institutions which are adopting these disruptions very fast will be able to survive in future and will able to garner more students. Institutes need to give something advanced to students, they can’t teach something which is outdated. So as an educator, you need to be updated, and institution that adapts will win the race.